Compared to liquid jets/films from conventional air-blast injectors, flow blurring (FB) injection has generated fine sprays immediately at the injector exit, resulting in the clean combustion of various fuels including viscous oils. 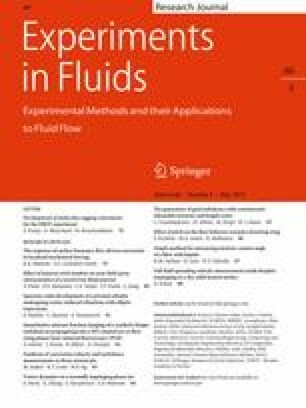 The FB atomization involves primary atomization by bubble bursting of the bubbly internal two-phase flow due to the dramatic pressure drop at the injector exit and the secondary break-up of droplets/ligaments by Rayleigh–Taylor instability. Recently, a novel swirl-burst (SB) injector has been developed to further enhance the secondary atomization, which has resulted in less lifted and cleaner flames by integrating swirling atomizing air with the FB concept. 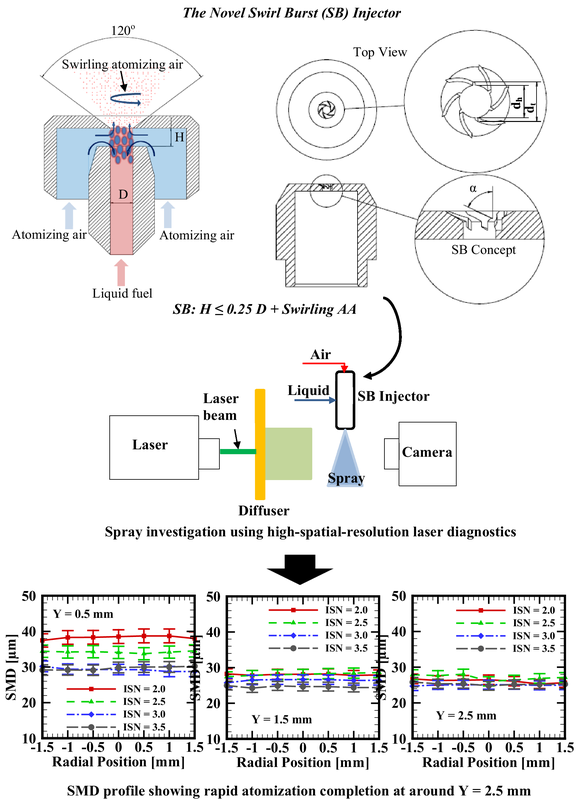 The present study investigates the effect of injector swirl number (ISN) on spray characteristics including droplet velocity and size distributions in the injector near field (8 mm × 4 mm) using particle image velocimetry and shadowgraph imaging for the SB injectors with diameter, D, of 1.5 mm. The study investigates four ISNs from 2.0 to 3.5 with an increment of 0.5, corresponding to various swirl vane angles. Results show that all the ISNs have achieved a short break-up length (~ 1.67D) and fine atomization with final droplet diameter ranging from 12 to 40 µm and SMD around 25 µm. Droplets are evenly distributed at each axial plane for all the ISNs. Increase in the ISN results in enhanced secondary atomization and hence finer droplets within 1.67D downstream of the injector exit. Spray angles are typically narrower at the increased ISN. Regardless of the variations within the injector near field and the different spray angles, the break-up length and final droplet size are nearly independent of the ISN. This research was funded by the University of Louisiana at Lafayette Startup Fund and Louisiana Transportation Research Center [Grant number, 17-3TIRE].